How to Fix Ceiling Fan Wiring Problems: Common Problems with Ceiling Fan Wiring and How to Fix Them, Identify the Ceiling Fan Wires for the Right Connections, Wires for Ceiling Fan Light Fixtures, Wiring Connections that Cause a Tripped Circuit Breaker. Electrical Question: I replaced a ceiling fan and when I turned it on the light worked but when I pulled the chain for the fan the circuit breaker tripped off. I just installed a ceiling fan with a light to replace a similar unit. There were 3 wires coming from the ceiling that are white, green and black, and the same 3 colors coming from the fan. I connected all like colored wires together, and screwed in the motor. Then, I connected 2 more sets of wires, this time, the wires ended in plastic blocks that were supposed to connect to each other. All seemed to go well. The light turned on immediately, but when I pulled the chain for the fan, there was a small spark from the fan and the breaker was tripped. The light continues to work, but nothing from the fan, but consequently, one of our 3 outlets on the same circuit no longer works as well. This electrical wiring question came from: Megan, a Homeowner from Brooklyn, New York. Thanks for your electrical repair question Megan. Estimated Time: Depends on personal level experience, ability to work with tools and access to the switched outlet wiring and the location for the replacement ceiling fan. Megan, the two wires that you mention as supposed to be connected to each other may be the problem. The last wire connections should be taken apart until you can identify the wires as described in the installation manual that came with the ceiling fan. Some ceiling fans come with pre-wired connections for an optional light kit which may not be installed from the factory. The wiring for the optional light fixture should be capped off and not connected. 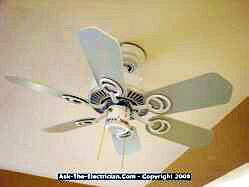 If desired, a compatible light fixture may be added to the ceiling fan and wired to the provided wires. Connecting a Power wire and a Neutral wire together will cause a direct short. If this is the case with your ceiling fan then connecting the last two wires together may have cause a direct short which would cause the circuit breaker to trip off. Separate the two wires and cap them off with a wire connector. The most commonly asked questions about installing Ceiling Fans, controls, light ceiling fan fixtures and other ceiling fan wiring questions and answers. This series of photos show the electric wire to ceiling fan box, preparing to mount the ceiling fan box,wire into the ceiling fan box through a wire bushing, attaching the ground wire, mounting the cradle bracket, the ceiling fan wires are connected, close the canopy, attach the fan blades and wiring a double stack switch,installing double stack switch, and explain how to connect the ceiling fan wiring blue wire. I replaced the chain pull switch for the light,in so doing a red wire came loose. I can’t find were it goes. The light works but the fan doesn’t. I closed it up to recover. A few days later I think I’m rested enough to fix the fan, so when I was removing the light bulbs I discovered the wires to the porcelain base were charred, brittle, and frayed. We decided to replace the fan. I’m ready to put the new fan up, but I can’t remember what to do with the blue wire at the ceiling box. I think I join it to the black wire, is this correct? Honeywell did a good job making a plug connector for the light fixture to fan easy. They didn’t do a good job with the instruction book. So the blue and black together at the ceiling right? When there is only a black wire, white wire and green or bare ground wire of the circuit wires leading to the ceiling fan, then yes, the blue light fixture wire of the ceiling fan connects to the black wire of the circuit wires. This will enable you to control the light fixture by using the pull chain switch on the ceiling fan. I am installing a Hunter ceiling fan that has a light. The wires coming out of the fan are black, black and white, and white. The wires coming out of the ceiling are 2 black wires and 2 white wires and 2 copper bare wires on a single wall switch. When I try to wire the black wires including the black and white from the fan and wire the white wires together it bypasses the switch. How should I be wiring so the light and fan operate from the switch? I am replacing my ceiling fan. My existing fan is operated by 2 switches, one controlling the light and one controlling the fan and speed. So I have a red, black and white wire coming from my box in the ceiling. My replacement fan has only a single black and white wire which appear to run through the fan motor to the light kit as well. I would like to be able to operate the light independently from the fan and utilize both switches on the wall. Fan directions say “light kit may be wired to additional wall switch if desired”. How do I wire my light to the separate switch? My first fan has an additional blue wire coming from the rod, so I’m wondering if the electrician added an additional wire and separated the light and fan inside the housing? Please help. I must say that it is odd that there is not a blue wire or a separate wire for the light fixture of the ceiling fan, therefore it appears that you may have to install one yourself and make the separation. However, before you do that I would look in the instruction booklet and see if it does in fact show that a separate wire should be there as installed from the factory, and if so then I would return the ceiling fan and have it replaced, and inform the store that the first ceiling fan was not wired correctly from the factory. I have a hunter ceiling fan no light 3 wire red,black, black/white where do i wire the black/white wire? or do I just cap it off? If there is no light fixture with the hunter ceiling fan then you may still have the blue wire or another colored wire for the light fixture which is still provided so a fixture may be added in the future. You may either cap off the light fixture wire or connect it. The internal unused fixture wire should be capped off by the factory. Your ceiling wiring connections to the ceiling fan should be made to reflect the wall switch wiring configuration of the room. I am replacing a ceiling light with a ceiling fan. The current light is controlled by one wall switch, yet the wiring in the ceiling box has a red wire in addition to the normal black, white and ground wires. The light had the black wire on the light attached to the red wire. The white wire on the light was attached to the white wire in the ceiling box. The black wire has a wire nut attached and is not used. Why is the red wire used and how do I attach my fan leads? Bob, Some ceiling boxes are pre-wired for ceiling fans where separate switches may be used for the fan and light. In your case the red wires is the one being used, so the wires of the fan and light of the ceiling fan connect to that red wire. Note that you may install an additional switch if you so desire.